Mark Duffy has written the Copyranter blog for 12 years and is a freelancing copywriter with 25-plus years of experience. His hockey wrist shot is better than yours. Would you hire a broke stock broker? How about a hacked hacker? Then why would you hire an ad agency that sucked at advertising itself? Surprisingly, most agencies are bad at promoting themselves. Why? Maybe, it’s the same reason they tell clients why they need an outside ad agency to do their ads — perspective. They’re too close to the brand. Or maybe it’s because all agencies, especially those that sell themselves as “creative,” are pitching pretty much the exact same product? The event that spurred this post happened in June at the Cannes Lions when Publicis soiled the bed with an awkward double announcement. First, with no internal heads-up, it banned all of its agencies from entering awards shows in 2018, immediately creating a flood of business for “creative” headhunters and recruiters. Then, it announced the hatching of Marcel, some sort of AI platform that none of its executives could quite clarify for the media. Maybe Publicis should have consulted a PR firm first. It owns a few, yes? One obvious solution for agencies is to pay another agency to do their ads. But if your agency does a great ad for a rival shop, it might end up costing you business. Maybe big agencies can do small agency ads and vice versa? Unquestionably, the following agencies definitely should have gotten somebody else to execute these terrible, bad, no good ads. Below are just the four worst since 2000 or so. There are scores of other bad ones lined up around the block that just missed out. This is probably The Worst Agency Self-Promo Ad Ever Created. Most of you have seen this video, despite Sapient’s best efforts to scrub the entire internet of its existence. If you really feel the need to see/hear this “corporate anthem” video, go here. It’s a painful 2:32, aurally, visually and cerebrally. Related: Publicis bought Sapient in 2015. Sure, it was an industry ad, but do you really want to be publicly lauded for putting the screws to consumers? Cheers to Evil! My guess is since this was a lowly program ad, Y&R’s higher-ups never saw it. That’s no excuse, though — somebody approved it. Why not a .44 magnum or a Desert Eagle hand cannon? The Chicago agency’s tagline at the time was “marketing solutions for people with spines.” No mention of “brains.” Yes, it’s still in business. Send your complaints here. If there was a No. 5, it would be this ridiculously stupid NSFW 2011 baby-with-big-balls ad by Herezie Paris. Evidently, the ad only hung on its office walls. But it sent the ad out to ad sites to be judged, so here it is. You want to see a good ad agency ad? 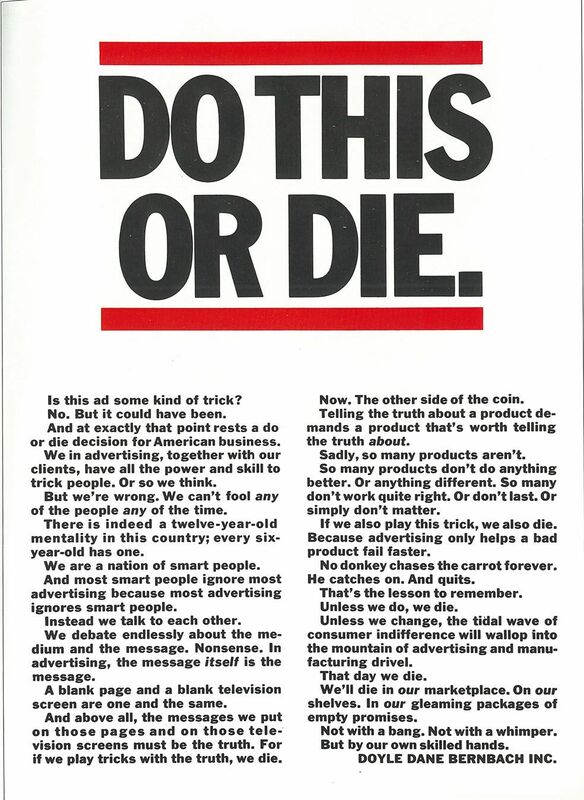 This 1969 ad by Doyle Dane Bernbach ran in Time. Read it. Today, nobody knows how to write ad copy anymore. But one would think that by now, agencies would have at least gotten an inkling of a clue about how to smartly present themselves. One would think.